Oh, boy. Another issue of BMB’s Iron Man. It’s almost over and I’m still not really sure what to tell anyone if they ask me how his run has been. Which part? All-New All-Different Tony? Ironheart? Or Doom? But I digress. It sounds more like I’m criticizing Marvel’s relaunch strategy, doesn’t it? That’s a post for another day. If we’re talking about the quality of the series itself, it’s certainly a mixed bag. The Tony Stark stuff has been…fine, I’m surprised how much I like Riri despite the problems tied to her introduction, and Iron Doom was a fantastic story with the worst ending you could imagine. Now that the three have converged, the book itself is starting to share those qualities. 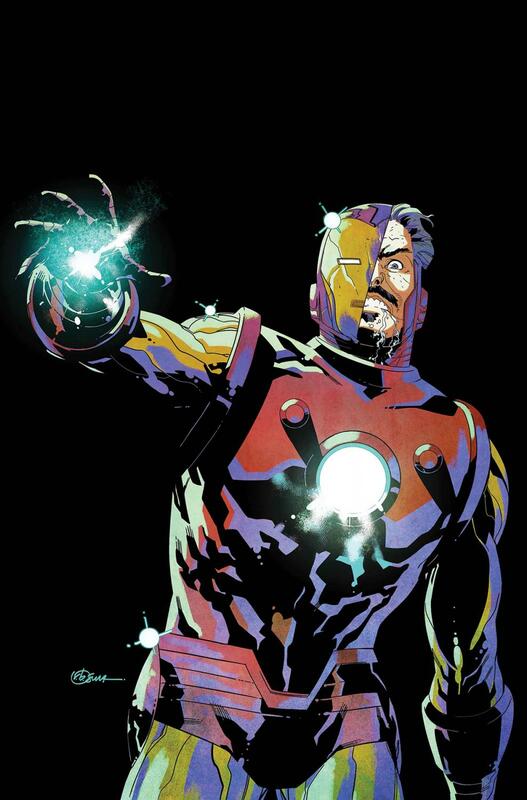 This is an Iron Man era that will be talked about long after it’s done, but not for the right reasons. Mild spoilers inbound. I can’t help but roll my eyes at the way Invincible Iron Man has been recapping its progress. They know that barely anything has happened in the story, so if they did it normally, it would only be two panels. Instead, it just makes for even more awkward Bendis dialogue. Because, crazy! Ugh. This issue takes its quest to annoy me a step further by not telling us why Blade showed up at the end of the last one. If I had to guess, I’d say it’s because there’s no good reason for him to be involved in the first place, and Bendis is hoping by the time we get an answer, enough time will have passed for us to even care anymore. To top it off, Riri’s dilemma with Stark Industries is solved in the most boring way possible. “Um, actually, WE have the rights to your armor, and you can totally have it!” Okay, so them taking her armor away didn’t really stop her from doing anything before she could get it back, so…. what was the point? Filling up those last couple Iron Man issues? Yep, this arc has been bloated with filler. It’s not all bad, though. I love what Bendis does with Doom this time around. It’s actual progress for him as a character, joined by some KILLER art by Alex Maleev. Doom visits his mother’s grave at the beginning, and while a gray and white palette might seem bland to some, I would say that Maleev perfectly emulates the loneliness, frustration, and despair of Doom’s situation. Stefano Caselli’s work is as enjoyable as it ever was, but there were some parts where it was hard to appreciate facial expressions because Marte Gracia went just a little over board with the shadows. Even when Riri is visiting MIT and about to get some great news, there’s an ominous, dreadful atmosphere that doesn’t exactly match the situation or her feelings about it.